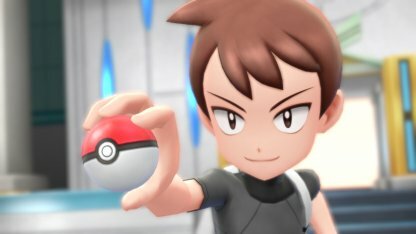 Read this Pokemon Let's Go Pikachu / Eevee guide on Partner Pokemon Exclusive Moves, where to learn them, their statistics, effects, & more. What Are Partner Exclusive Moves? 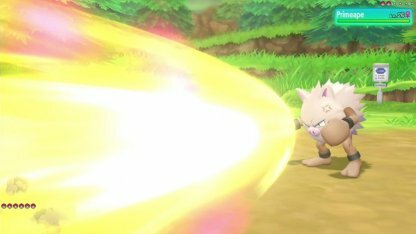 Pikachu's Partner Exclusive Moves deal fast & heavy damage - focusing specifically to counter his Type weaknesses. 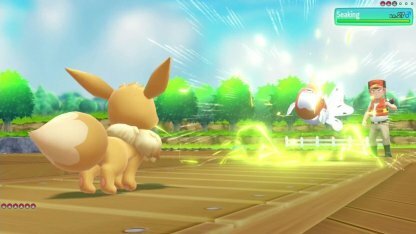 Eevee's Partner Exclusive Moves are learned early in the game but lack the firepower to be extremely powerful when facing late-game battles. It's useful, however, as support moves to implement status effects. Talk to the Partner Exclusive Move Tutor located at the Cerulean City Pokemon Center to learn this move. 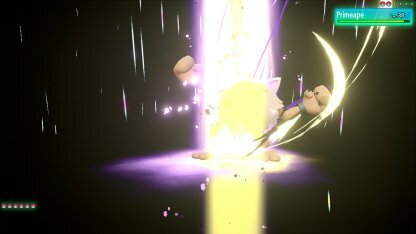 Using Pikachu's Zippy Zap guarantees that you'll hit your target first. It also will always make a Critical Hit. You can learn this move by heading to Fuchsia City - the Partner Pokemon Exclusive Move Tutor who teaches Splishy Splash will be there. Splishy Splash is a high damage Water Type attack that can cause paralysis on its target. Head to the Pokemon Center in Celadon City to learn this Flying Type Move. The Exclusive Move Tutor is located there! Floaty Tail does high Flying Type damage and can cause its target to flinch when hit. 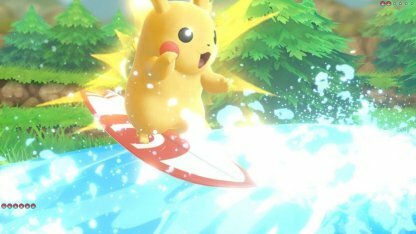 Pika Papow is Pikachu's Exclusive Move that changes its strength depending on your relationship with your partner Pokemon. The better the friendship, the higher the damage. It also never misses. Talk to the Exclusive Moves Tutor in the Cerulean City Pokemon Center to learn this Water Type move. 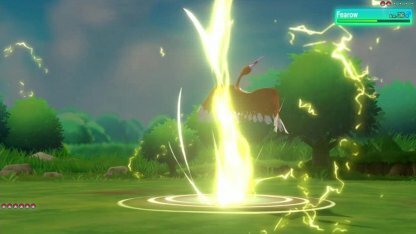 With this move, Eevee can dish out strong Water Type damage plus heal Eevee for half the damage this move causes to its target. Talk to the Exclusive Moves Tutor in the Cerulean City Pokemon Center to learn this Electric Type move. Buzzy Buzz not only hits with Electric Type damage, it also causes target to have paralysis on hit. 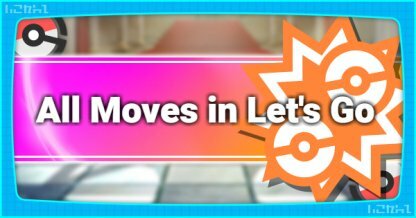 Talk to the Exclusive Moves Tutor in the Cerulean City Pokemon Center to learn this Fire Type move. 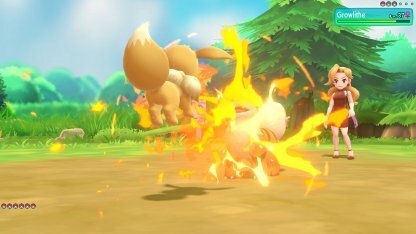 Eevee's Sizzly Slide Exclusive Move is a hard-hitting Fire Type attack that leaves the status effect "burn" on its target. 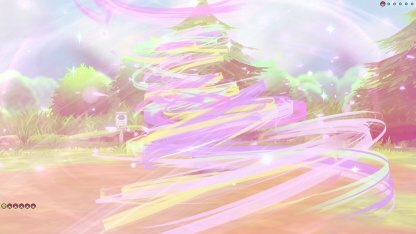 You can learn the Psychic Type move "Glitzy Glow" from the Partner Exclusive Moves Tutor in the Celadon City Pokemon Center. 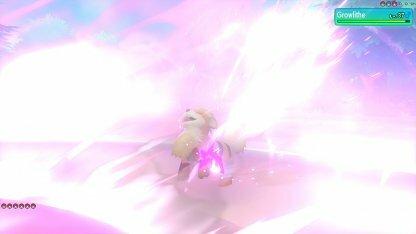 Glitzy Glow will protect Eevee from half the damage of a Pokemon's Special Attack. 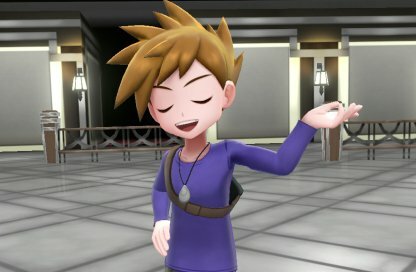 You can learn the Dark Type move "Baddy Bad" from the Partner Exclusive Moves Tutor in the Celadon City Pokemon Center. 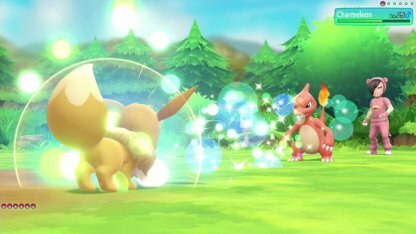 Glitzy Glow will protect Eevee from half the damage of a Pokemon's Physical Attack. The Partner Pokemon Exclusive Moves Tutor in Fucshia City will teach you this Grass Type move. 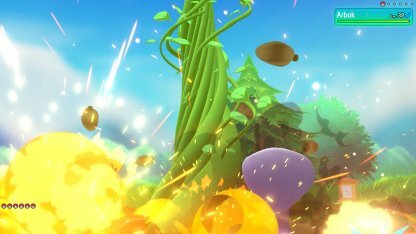 Eevee's Sappy Seed will send out HP-sucking seeds to its target. It deals Grass Type damage & heals Eevee for a set of turns. 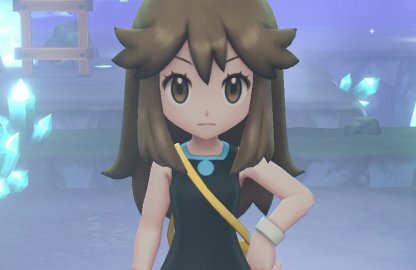 The Partner Pokemon Exclusive Moves Tutor in Fucshia City will teach you this Ice Type move. 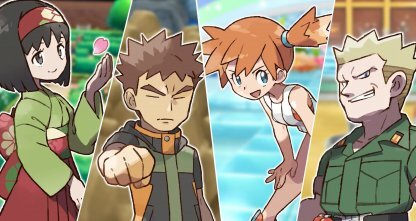 This move resets the status of all opponent Pokemon in the field, removing buffs that help in battle. 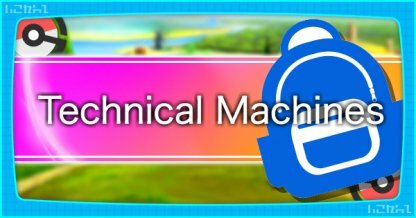 The Partner Pokemon Exclusive Moves Tutor in Fucshia City will teach you this Fairy Type move. 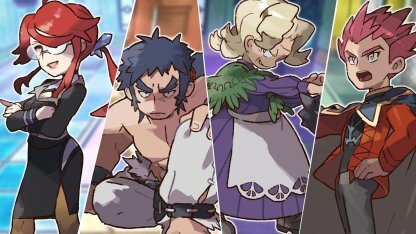 This move will remove any ally Pokemon's Status Effects that are a detriment to the Pokemon battle. 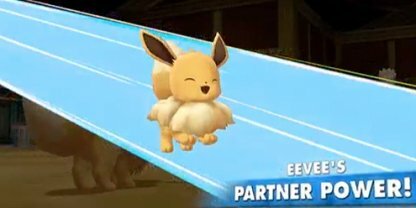 Veevee Volley is Eevee's Exclusive Move that changes its strength depending on your relationship with your partner Pokemon. The better the friendship, the higher the damage. It also never misses. Each Partner Exclusive Move has a unique effect. 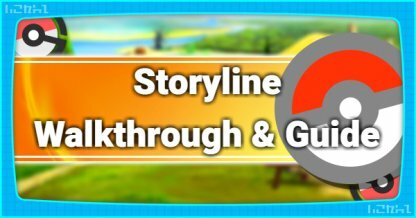 Some moves' power changes depending on your relationship with your partner Pokemon & some can implement status effects with 100% probability. 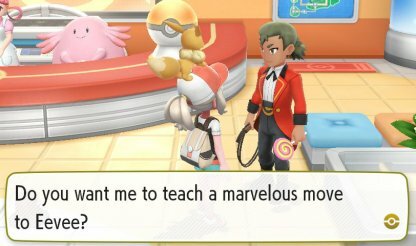 You can learn partner exlucisve moves from tutors in Pokemon Centers. They can re-teach the move as many times as you want. If you've swapped out one exclusive move with another, you can re-learn the previous move from the tutor again.